Danville, PA– Autumn Frost Christensen was born to Steve and Jocelyn Christensen on Friday, October 24, 2008 at 10:02 PM. She weighed 8 pounds 5 ounces and was 21 ½ inches long. 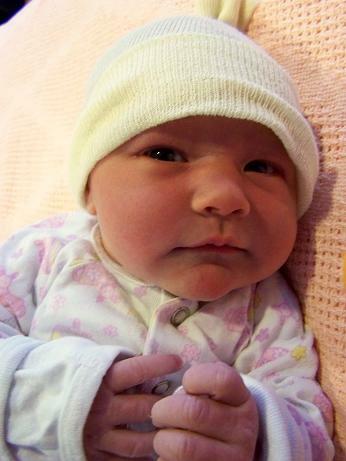 Arriving eight days before her due date, "She is our sweet October surprise," says Jocelyn. One thing that did not surprise Jocelyn was the news that she was in labor—she had been having contractions for a few days prior. Her midwife confirmed this at a regular appointment on Friday and sent her directly to Geisinger Medical Center in Danville. After a long and exciting day of labor, Autumn found comfort in the arms of her mother. "It's a girl!" announced Steve, confirming Guy and Jocelyn's hunch about the gender. Call it "mother/brother intuition," but this is the second time they have predicted the gender of the baby without the use of an ultrasound! Steve and Jocelyn were overjoyed to meet their new daughter. The whole family was finally united the next day. Upon seeing baby Autumn, very attentive big sister Scarlett gleefully exclaimed, "Baby, baby!" and proceeded to tickle her toes. Meanwhile, older brother Guy was surprised by her small size, asserting, "She's so little." He also noticed Jocelyn's hospital attire and observed, "Mommy is a doctor!" Steve and Jocelyn named the baby Autumn Frost, because of their enduring love of the names both independently and in concert, and because she was born on a beautiful fall day that began with a frost-covered morning. The family will return to their home in Lewisburg on Monday to begin their new life together! congrats again...wonderful to have the baby here I'm sure and meeting her new family. Enjoy each moment-they grow sooo fast and change daily at this age. Hi, Congratulations! what a beautiful baby and a beautiful,unique name.